The second canto of Dante's Inferno is in some ways a continuation of Canto 1, where Dante encounters the poet Virgil while lost and impeded in the selva oscura, the dark forest of mid-life dissolution and oppression. 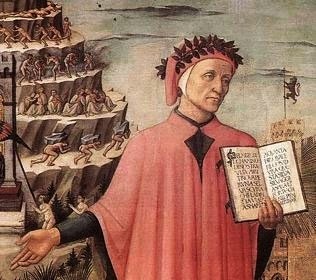 Dante agrees to be be led by Virgil through the realms of hell and purgatory in order to reach the portals of paradise and thereby participate in the beatific vision. In Canto 2, Dante realises the depth of commitment required in such an undertaking and has second thoughts about the whole venture. Virgil then elaborates on how he was himself inducted into the mission of rescuing Dante by Beatrice, Dante's first love whose earthly life ended at an early age. Virgil enables Dante to overcome his fears and commit once again to the transformative journey that will take him from a state of ignorance, desire and passion to one of progressively awakening insight. Canto 2 of Dante's Inferno can be streamed using the media player above. A CD quality audio file is also available for download here.